You remember that ad with a half-frog I posted two days ago, right? I thought it was a bit of eye-catching advertisement and wanted to capture it. Well, I didn’t get another good shot at it, so I cheated and went to the company’s Facebookpage and stole borrowed the total image. I also thought the second one was too cool and it was the one that caught my attention first. This morning, I got the 'You know you want me.' shot. People might have been wondering what the heck I was doing. Anyway, I think this is a cool and innovative approach advertising by iprintdigital. 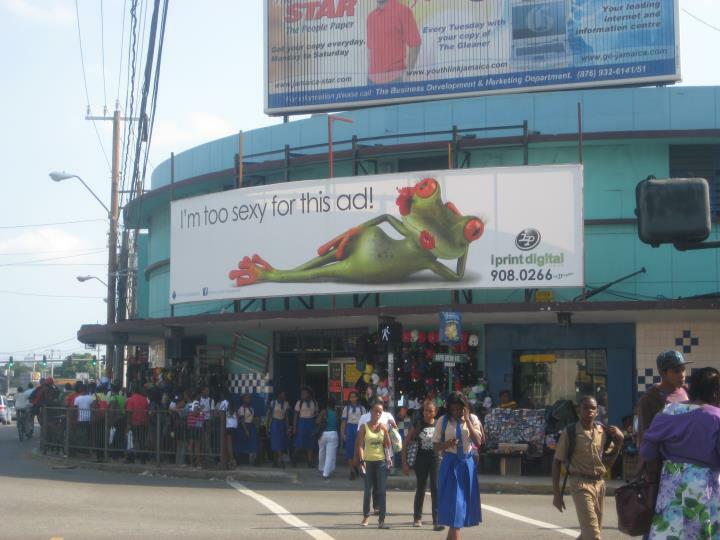 That flirty little frog made me go out of my way to see what product she was advertising. It really works, 'cause I'm definitely not a fan of frogs or anything with more than two feet that travels close to the ground. Enjoy! I’m also including the book trailer for my upcoming novel, Hardware. Have a peek – please, pretty please - if only for the irie reggae beat? On my trip around the blogosphere this week, I’ve seen some interesting books and short stories up for release soon. On Monday, I want to do a post highlighting all the good stuff that’s being published in the next few months. If you have something that’s being released shortly and need a little plug, or if it's out and could use a mention, shoot me an email at jmwordsmith at gmail dot com. Have a great weekend and meet some writing goals!